Gold has been making a comeback in a big way. 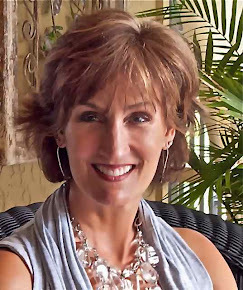 From our guest blogger, Jane Blanchard at Modernize.com, here are some great tips on how you can use gold accents to add some sparkle to your home. From the classic gilded age to Beyonce's gold dresses, gold is totally in right now. But what's even more in? Gold accents in your home. From classic luxury to metallic modern, gold accents bring out the best in any room. Here are some great ways to use gold accents. Bring out the best of your wall decor with something simple and shining. 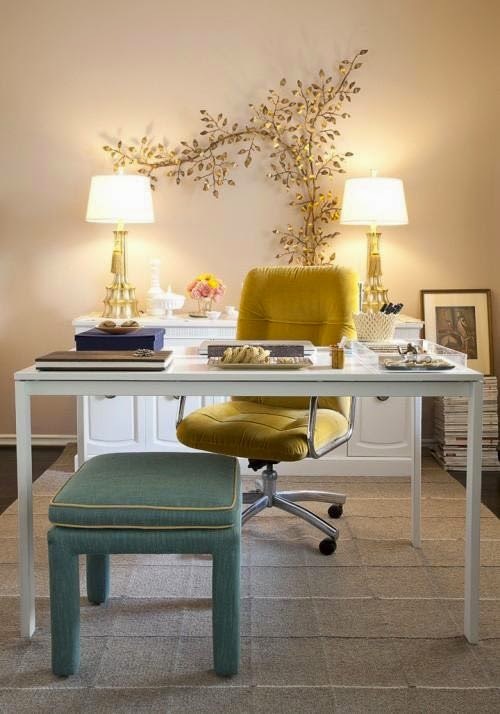 The gilded tree along with the gold lamps bright a beautiful brightness to this office space. 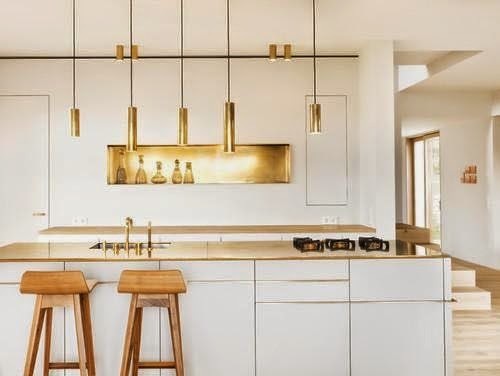 The gold really makes this contemporary kitchen stand out. Gold brings about a sense of smoothness and cleanliness and goes so well with the stark white. The gilded countertops must make anyone sitting there feel like royalty as they eat their breakfast. 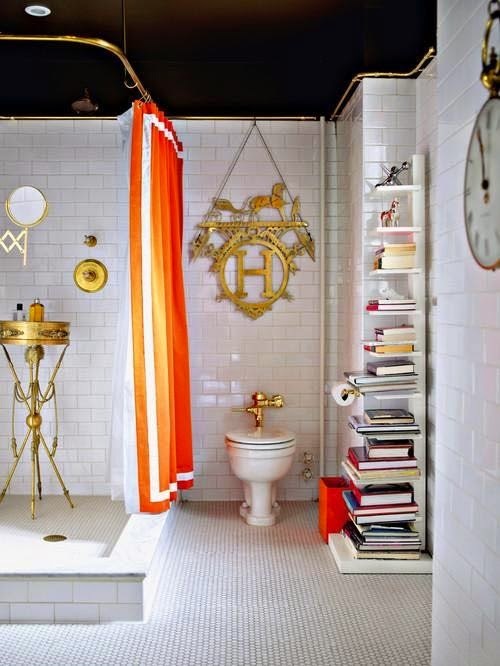 There are so many simple ways to incorporate gold into a bathroom. In this example, the toilet handle, mirror, shower head, and the gold letter accent piece work together to give this bathroom a fabulous, polished look. 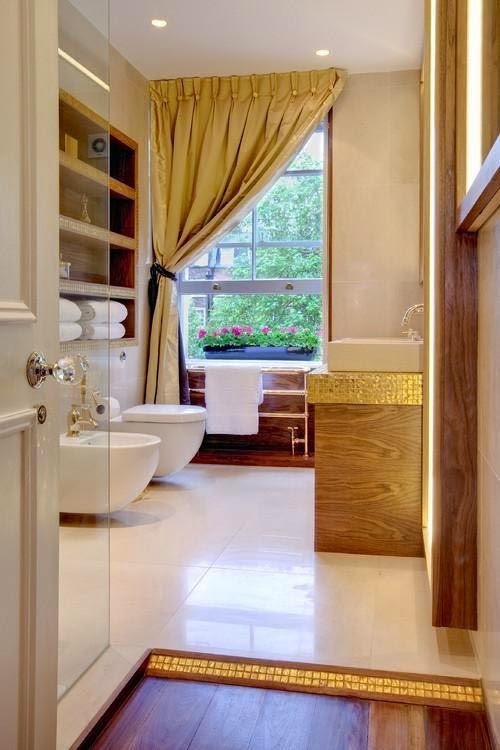 For a more blunt way to bring some gold into a bathroom, you can forgo the fixture accents in favor of something more obvious such as a curtain or a sink. The water will reflect beautifully in a gold basin, and that tile work is simply gorgeous. 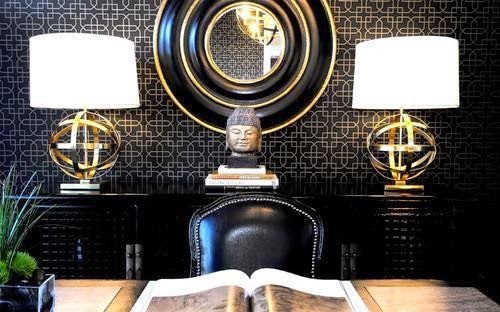 On a black wall, gold is the ultimate accent color. 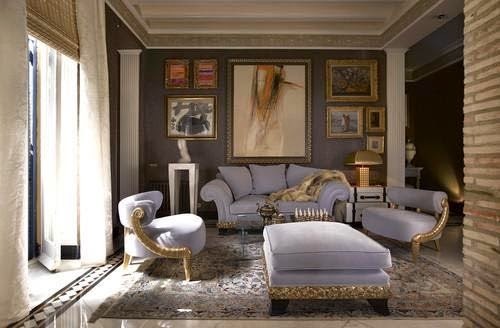 It brings a sense of luxurious elegance and creativity to a space that might look overly professional for a personal study. The statement piece lamps have curves that really soften all the straight lines. Gold is a great pop-out color in an elegant monochrome. Put the color where it really matters, like a few accent pillows to draw the eye to a beautiful sofa or a piece to liven up an empty wall. 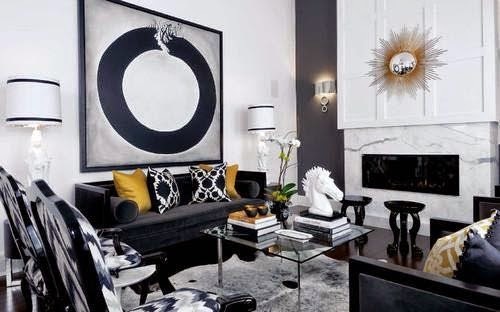 This room speaks high fashion and couture without being too far out-of-this-world weird. One of the most timeless ways to use gold as an accent is in furniture trimmings. It brings about some old school classic and a vibe of a rich Victorian era beauty if used in the right way. 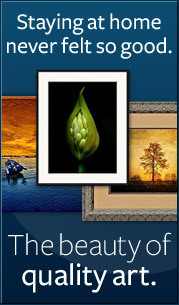 To bring it into to the 21st century, use it to frame some contemporary art or pick a more modern day color to go with it. Need more home inspiration? Check out Modernize.com.